Hi all! I just published my Mission and Notification system on marketplace. I would like to share some of the features of it with you.This project is 100% Blueprint. And all system works dynamically. There are over 30 variables that you can set just for one mission. Also if you want to make something special, you can call every event where ever you want by calling 'Game Manager'. By default i added 8 points as 4 cardinal 4 inter-cardinal to compass. You can remove or add dynamically from HUD_Component class defaults. Also as you can see in the images there is an array to add default mission actors on begin play. Compass gets markers dynamically during the mission. It's hiding or showing not related markers on mission start or end event. Mission system basically works on missions that you have created from class defaults. It's an array so there is no limit. You can change even color of the borders! Every marker you have add to array will displayed by index. When character overlaps to first one, the second one will be appear and sub mission will be changed. And there are also Optional Missions array. You can increase the rewards if the player can complete them. Actualy side missions works just like the main missions but the only difference is they are using different actors, a bit simple variables and using a different layouts! This pack also has XP and Level system. Every XP that you get from missions will make your character level up. You can add specific Target Point Actors to map to define the mission marker location. Also you can add Remove Optional Mission Actor to world to remove optional mission just by selecting from optional missions array. You can create Special Areas to change compass color with dynamic background. Also you can add Landmarks to your compass just by adding Landmark Blueprint in to world. It will automatically add to the compass. And there is lots of more! You can test it yourself from Playable Demo. Last edited by Nocte Gaming; 04-13-2019, 02:30 PM. Commented on your Marketplace comments to. It is very very nice, except you need the ability to have multiple accepted missions (at least a couple) in your array, with one set active ( ability to change which one is active) and currently working on. Then ill definitely buy. Thanks for your support i really apperciate that Well i’m thinking of lots of updates for this asset but this feature wasn’t in my mind at all. I really couldn’t understand why would a game let you to accept more than one mission. It would break the whole system because when you accept one of them the other ones are disabling automaticly. Could you please give some examples? I can not promise for that but i can deffinitely think about it. Last edited by Nocte Gaming; 10-15-2018, 07:01 PM. WOW is a good example. as long as the other quests dont need to be after the main. So maybe a bool, or array of quests by name or id that need to be finished b4 this one can be added? Oh i misunderstood at the first time sorry. Now i get it i guess. You want to get the missions that character possibly can accept and add to the list. Well all of the missions are containing in an array so this is actualy possible and should be easy to add to it. This needs an another ui and a little bit blueprinting. Right now i should work on the mission types as just like you said. There will be kill, follow, talk and in-time missions for now. And i want to add multiple markers for a one mission. It will be something like you need to kill 4 targets and there will be 4 markers. I will also work on improvement of the UI animations. So your suggestion probably won’t be in the system in next update but i will definitely add it as an option. Last edited by Nocte Gaming; 10-19-2018, 02:50 PM. I added press and hold button events and macros which allows you to use it any where you like and with any key you want. Changed the landmark a bit. It will show up when you near to it and it will dissapear if you are far away or inside of it. I imporved some of the widgets like Mission Finish, Update Notification events. You will be able to choose between old and new ones. I made the Player Situation ( Mini map Area/Xp/Health ) widget modular. Now you can turn on and off. Also for XP and Level i added another layout which you can change easily. You will be able to set actors enabled or disabled any time you want. These are that i remember for now, ofcourse it's still work in progress. I still need to work on side mission actors. There will be lots and lots of more. I hope i won't make you guys keep waiting and hope you guys like it. If you have any suggestions/comments please let me know. I just sended the updated file. I tried to keep this asset more like in story based. So you will be able to enable/disable actor(s) during game. Also i decided to give the same features for the side mission actors and i put all of the variables in one base actor. You will be able to select the type of the mission (Main/Side) with an enumeration. Added 'Play Sequence Event' which allows you to play any sequence any time. Thanks! Got new updates besides this post. And about your question, yes actualy it’s really easy to integrate. All you need to do is add ‘Mission Component’ to character and call some events on begin play and on mouse inputs. Other than that there is only 1 ‘Cast to’ event to change. There is actualy a tutorial video for old version of this project but most of the process is the same. Let me know if you need to know more and don’t forget to join our discord channel. System uses Data Tables and you don't even need to check blueprints to create a mission. Unlimited possibilities for a mission. Each of the marker can be set as compass or screen markers. Kill, Kill Groups, Kill Monsters, Collect, Reach and Interact objective types with dialogue system. 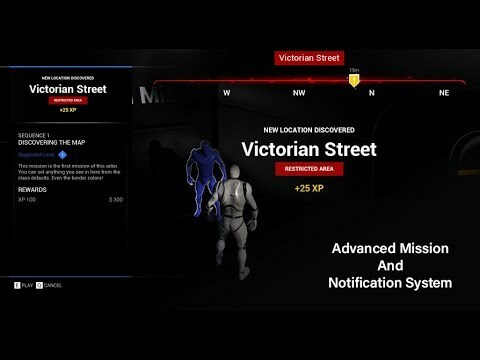 Main, side and overlap mission actors with multiple/single mission layouts. Tons of widgets that you can call where ever you like and each one of them are fully customisable. Monster and collectable markers are distance sensitive. Which means you can show/hide them depends on the distance. Also can be add as compass or screen markers. Also you can add Landmarks to your compass just by adding Landmark Blueprint in to world. It will be automatically added to the compass.